Mallorca is always a good idea, and Puerto Pollensa is a very popular resort! Within Europe it is quite simple to get to this beautiful island, just after a short flight you will find yourself in a different world – in a real paradise. But how to get from the airport to Puerto Pollensa? Let us explain you how. When you look at the map of Mallorca, it may look like it will be a long journey from the airport which is located in the south to Puerto Pollensa in the north, but it is not really and there are many options of travelling. So you have touched down at Palma De Mallorca airport. No doubt the priority is getting to the hotel/place of accomodation. Known locally as Son Sant Joan Airport, this is the only airport on the Island of Mallorca which is the most popular holiday destination in the world for Britons. A large number of airports in the UK and Ireland operate direct flights into the capital. These include Belfast, Bristol, Bournemouth, Birmingham, Coventry, Durham, Doncaster, Edinburgh, Exeter, Gatwick, Glasgow, Leeds, Luton, Manchester, Newcastle, Stanstead, and Nottingham. When you book with a tour operator, the transfer will be organized from Palma de Mallorca Airport to the hotel in Puerto Pollensa. It may take a little bit of time as you will be going to more hotels but at the same time you get a first impression of Mallorca. Price: Normally the price is already included in the package price. You can also book a private minibus transfer so that you have a driver waiting for you when you land, giving you peace of mind, and you don’t have to queue for taxis or get on and off buses. This service will be just for you with no other pick ups or drops-offs en route and we will take you direct to or from your accommodation. This service needs to be booked in advance. There are always a large number of taxis available at Palma de Mallorca Airport. They cannot be hailed randomly – it is necessary to join a queue, where you will be directed to a taxi that is waiting. The taxi rank is outside the arrivals hall. This page provides information on where to catch taxis from Palma de Mallorca Airport to Puerto Pollensa resort, taxi prices, supplementary charges, extra large taxis, taxis with disabled access, long distance taxis, complaints procedures. Prices: 73€ for a day transfer, and 79€ for a night transfer based on official rates at 01st April 2015, more info here. Then, there are the local busses which may be not the quickest way, but it is the cheapest way. When you arrive to the airport and after getting your suitcases, you get to the arrival hall, make your way outside and you will find the taxi rank on your right hand side. 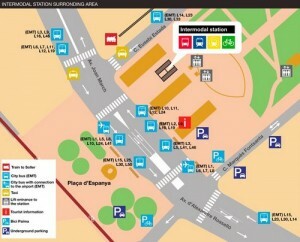 If you walk past the taxi rank, you will get to a bus stop where bus nr. 1 will leave from every 10 minutes. To continue the travel to Puerto Pollensa you will have to take the stairs down to a bus station which is located underneath Plaza España. There you will find all the busses going everywhere outside the city. 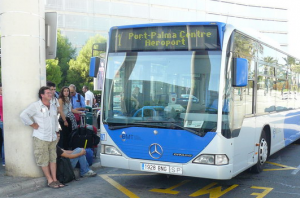 Bus L340 is the one that goes up north, to Pollensa and Puerto Polllensa. The journey takes about an hour and will cost about € 6,30 one way. Ideal is you can leave your suitcase down the bus, so you don´t have to carry that big thing inside with you. Once you get to Puerto Pollensa, you will have to find your apartment or hotel. Get down the bus at the small bus station in the center of the village, next door you will find the Tourist Office where they can provide you with a map of the area. Puerto Pollensa is not huge, so after a short walk you will get to your final destination and you will be able to enjoy and relax!! The beach and sea are just perfect for a relaxing holiday and probably one of the reasons why you have chosen to stay in Puerto Pollensa. Don´t forget Mallorca is absolutely beautiful and there is so much more to do and see. A boat trip, an interesting and fun sightseeing excursion, a family day out to a waterpark for example, a night out and a lot more. We call them value for money experiences! For more local information, but also details about possible excursions you will be in good hands at No Frills Excursions office along the main road near the Burger King in Puerto Pollensa!